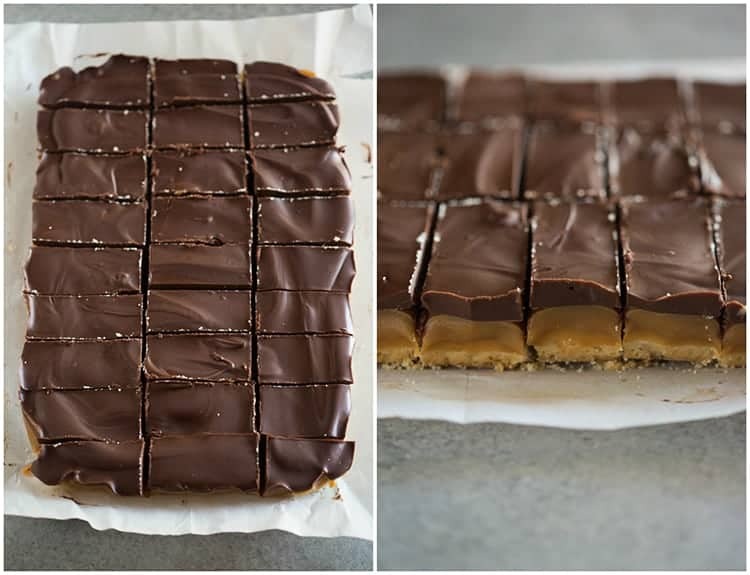 I first made this recipe back in 2015, after my twin sister called me going on and on about some homemade Twix bars that she had at a little sweets shop in Utah called “The Sweet Tooth Fairy”. 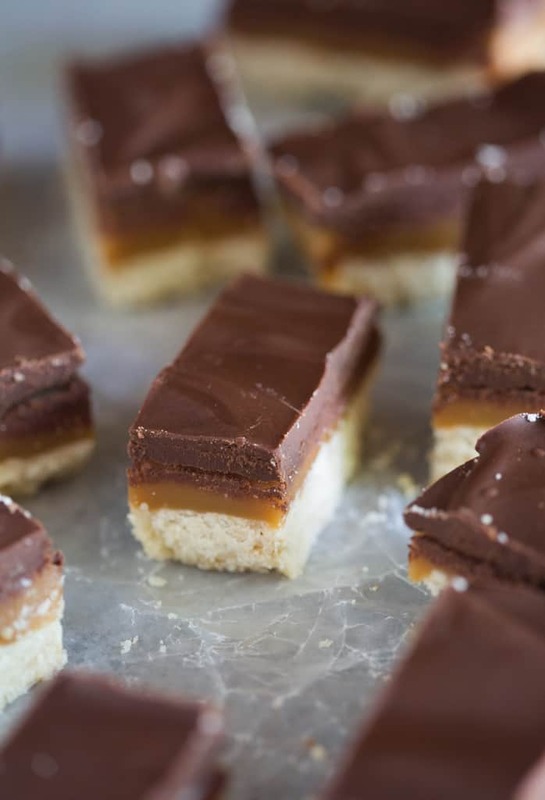 She described each detail of their homemade treat: a shortbread crust, a thick caramel layer, and chocolate on top. If that’s not your cookie bar love language, then I don’t know what is! 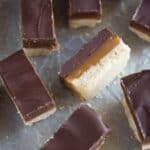 I wasn’t the first to share a similar recipe online, but I may be the first to use an incredible homemade caramel layer, rather than melting store-bought caramel. That layer of homemade caramel is completely what sets these apart. Start be making an easy shortbread crust. You only need five ingredients: flour, butter, powdered sugar and vanilla. This shortbread crust recipe is adapted from King Arthur Flour, and it’s just as excellent as it is EASY. Press the dough into the bottom of a parchment lined 9×13” pan. I like to line the pan with parchment paper so that I can lift the bars from the pan once they’re completed, and cut them much easier. While the shortbread crust cools, make the caramel. Add all of the caramel ingredients to a saucepan and bring to a gently boil. Boil, stirring often, until the caramel is golden colored and passes the “soft ball” ice water test. Grab a cup of ice water, spoon some of the caramel into it. Use your fingers to try and pinch the caramel sauce together into a ball. If you can for a really soft ball with your fingers, it’s ready. Pour the hot caramel over the cooled shortbread crust. Allow to cool, for a few minutes, and then refrigerate for at least 2 hours, or even overnight. Smooth melted chocolate over the caramel and allow it to set. All chocolate is not created equal, when it comes to melting, so use a chocolate with a higher ratio of cocoa butter. I like to use baker’s chocolate bars, a good quality chocolate bar, or melting chocolate. If you want to use chocolate chips, you will need to add more butter to get them to melt properly, and I’d choose a high quality brand, like Ghirardelli. Store the bars in the fridge. These bars really are incredible, and they get rave reviews wherever I bring them. Hope you love them! Preheat oven to 300 degrees F. Line a 9×13″ pan with parchment paper, or spray really well with non-stick cooking spray. In a large bowl, use a pastry blender to combine the butter, sugar, flour, and vanilla until the mixture comes together. Press the shortbread dough into the pan. Bake for 28-35 minutes or until the crust is very lightly golden. Remove from oven and allow to cool completely. Combine all of the ingredients in a medium saucepan over medium heat. Maintain the heat at medium and bring mixture to a rolling boil, stirring often. Continue to cook, stirring constantly until the mixture reaches the soft ball stage, about 15-20 minutes). I test the "doneness" of the caramels using the ice water method: Stick several ice cubes in a cup and add cold water. Drop a spoonful of caramel into the ice water. 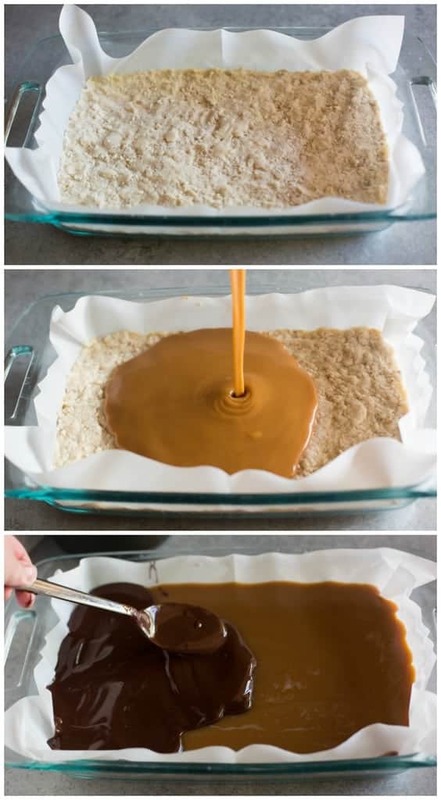 If you're able to clump the caramel sauce together in your hands to form a very soft ball, then it's ready. When the caramel starts to turn golden brown, I do the ice water test every few minutes until I find that it's ready, just to make sure I don't overcook it. Once it reaches soft ball stage, remove from heat and pour the warm caramel over the cooled shortbread crust. Allow to cool for a few minutes, then refrigerate for at least 2 hours, or overnight. Add the butter and chocolate to a bowl and use a double boiler (or your microwave at low power, 30 second intervals, stirring in between) to melt the chocolate until smooth. Pour melted chocolate over the set up caramel and smooth into an even layer. Refrigerate until the chocolate is set. Store in the fridge, covered, for up to 1 week. *Salted or unsalted butter can be used. 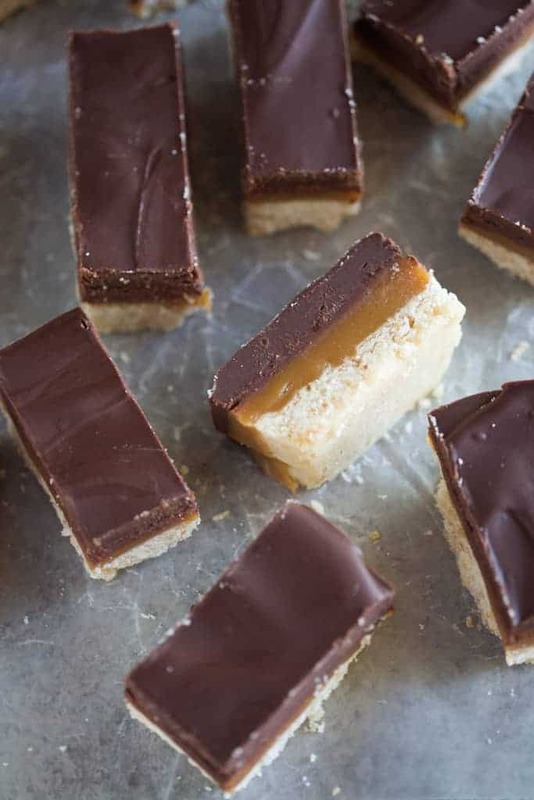 If using unsalted butter, add a pinch of salt to both the shortbread and caramel recipes. Shortbread crust recipe is from King Arthur Flour. *I first shared this recipe in April 2015. Updated April 2018. Made these this weekend and they were amazing. The office loved them! Thanks the caramel does make a difference! Right! Was super excited to make this. First off, don’t have corn syrup in Australia so I used golden syrup. Tastes great. Had quite a lot of caramel in the end, but it’s ok. When I tried to melt the chocolate and butter the chocolate seized up so I added some boiling water and all was good. Tastes really good, quite sweet but I mean that’s expected. Awesome!! Hi: I was looking for ideas for different cookies and the like for my nephew’s wedding rehearsal dinner and these looked like something I would like to include. I decided to give them a “trial run” before the party as it was my first time making caramel. I ended up with brown flecks in my caramel and I was just wondering why. Thanks in advance for any advice you can give me in this regard. Most likely the brown specks were from Caramel burning or scorching on the bottom of pan. I’d advise turning heat down slightly and be sure to scrape bottom of pot well each time you stir right from the beginning. Best wishes. Made once before to see if I could pull off the homemade caramel part, and if they turned out the way I imagined…and they did! SO well! Everyone loved them so much that they’re now requested as birthday gifts! Great recipe & instructions-me & my family thank you! These look yummy. Can these be put in the freezer? I haven’t tried it but I think so! These are so yummy and the recipe was easy to follow! But my chocolate topping separated from the caramel when I cut them into pieces. Maybe they were too cold when I sliced? I did cut them straight out of the fridge.